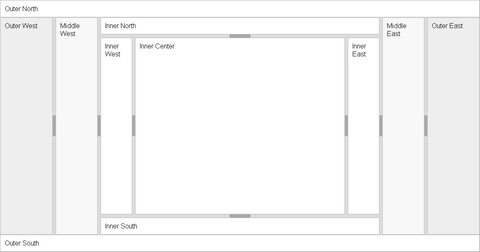 UI.Layout was inspired by the extJS border-layout, and recreates that functionality as a jQuery plug-in. The UI.Layout plug-in can create any UI look you want – from simple headers or sidebars, to a complex application with toolbars, menus, help-panels, status bars, sub-forms, etc. UI.Layout creates a ‘page-layout’ that has auto-sizing ‘center pane’ surrounded by up to four collapsible and resizable ‘border panes’ (north, south, east & west). It can also create multiple headers & footers inside each pane. For more complex layouts, you can nest layouts within layouts. Or use an iframe as a pane to create a ‘sub-form’ that can have its own layout. The possibilities are unlimited – from simple fixed headers or sidebars to rich applications. Layouts are created from existing elements (divs, iframes, etc), so UI.Layout will degrade gracefully. Combined it with other jQuery UI widgets to create a sophisticated application. There are no limitations or issues – this widget is ready for production use. You can checkout Demos page for a list of all demos and samples. I can’t wait to use it on something….anything! This looks pretty exciting. I moved off of ExtJS when they made it clear they didn’t want or particularly like open-source licensing, and one of the main things I’ve missed in moving to jQuery has been Ext’s powerful layout system. I’ll be playing with this one tonight to see if it lives up to the pitch, but I’m very pleased that someone is taking a shot at this type of functionality for jQuery. can I use fluidtextresizer.js and ui.layout jqery in same interface.